Born in Urbino on 21.08.62, studies at the “G. Rossini” conservatory of Pesaro and under the guidance of Master Jannaccone Michele, graduated very early in “percussion instruments” whit the highest marks and praise.He specializes in Marimba and Vibrafono, becoming one of the largest international experts. In 1979 he won the E.K.Y.O.ed competition and joins the Youth Orchestra directed by Master C.Abbado.enthusiast with jazz since childhood, in 1979 he started improvisational studies with master Giorgio Gaslini. Soon he became a collaborator, playing with the various Gasliniane, Solar Big Band, Octet, Duo, Globo Quartet, Trio, Italy and abroad: Hungary, Jordan, France, Germany, Belgium, Holland, Turkey, U.S. In 1983 he founded the “NEW OLD WAY QUINTET” with which he was ranked first in the “Emerging groups” by Forli, and the best new group at the “JAZZ CUP” of 1985. With the same group he participates in the best Italian jazz shows: Milan, Imperia, SanRemo, Genoa, Bologna, Fano, Rome, Soverato, Urbino, Assisi, Perugia, Florence, Cagliari. In 1985 and 1985, he studied technique and improvisation with GARY BURTON at the Umbria Jazz courses, winning the scholarship for BOSTON’s “BERKLEY SCHOOL”, which will be delivered by the great composer ASTOR PIAZZOLLA.Study Composition with LUIGI ABBATE, Arrangement and Orchestration with GIORGIO GASLINI and MARCO VILLANI. In 1990 he made music and orchestrator for the theatre show “LUCY IN THE SKIES” and for the record project MORMORO L’AMORE that he sees as the protagonist LUCIA MINETTI. He collaborates with the PIERA PRINCIPE choreographer-ballerina, performing for the theater of PALAZZO DUCALE in Cremona and the BIBIENA theater in Mantova, the music for the theatre show “THE MAGIC CIRCLE”. Realizes with ANDREA GIUFFREDI (tb), the musical project (FORME D’ARTE), produced by SUMMIT RECORDs Americana, as Composer and Author, for only trumpets and reciting voice. He writes and orchests the music for the project “THE RIVER”, for Soloists, Choir, Orchestra of Strings, Three Brass, Percussion Deciminus, produced by DAIGO Music School. GARY BURTON, MILT JAKSON, RANDY BRECKER, AND Saindon, ERIC MARIENTHAL, TOMMY CAMBPEL, Tullio de Piscopo, TONY SCOTT, J.HELBURG, GIORGIO GASLINI, Enghel GUALDI, CATERINA CASELLI, DAVID FOSTER, GIULIANO SANGIORGI, MALIKA, SAMUELE BERSANI, PACIFIC , MANUEL AGNELLI, GIANNI MORANDI, PAUL CORTELLESI, ANDREA BOCELLI, JOVANOTTI, MINA, CONCATO FABIO, M.BOSE ‘, ENZO IANNACCI, RON, ZERO RENATO, NINO BONOCORE, GIANNI and MARCELLA BEAUTIFUL, ROSSANA CASALE, LUCIO DALLA, STADIUM, LUIS AGUDO, TANITA TIKARAM, CARMEN CONSOLI, ANTONELLA RUGGIERO, AVION TRAVEL, GLORIA GAINOR, PAOLA MAUGERI, MICHELE CENTONZE, ROSARIO OF BEAUTIFUL, MEGI OF WOMAN, VITTORIO MATTEUCCI, STEFANIA MIOTTO, GIANLUIGI TROVESI, FRANCO INTRA, FRANCO and STEFANO CERRI , BRUNO TOMMASO, GIANNI BEDORI, BRUNO CROVETTO, MICHELE JANNACCONE, GIAMPIERO PRINA, GIULIO CAPIOZZO, ALFREDO GOLINO, CRISTIAN MAYER, ELLADE BANDINI, MASSIMO MANZI, STEFANO BAGNOLI, PIER FOSCHI, MAX FURIAN, ROBERTO GATTO, MAURIZIO DE Lazzaretti, GIANNI THE GREEK , FRANCO ROSSI, DAVIDE GIRLS, ARNALDO VACCA, PEPPE Consolmagno GIOVANNI IMPARATO, NACO, GILSON SILVEIRA, MASSIMO CARRANO, FAUSTO MESOLELLA, AUGUSTO MANCINELLI, SANDRO GIBELLINI, GIGI CIFFARELLI, ANDREA BRAIDO, ALESSIO MENCONI, PAOLO GIANOGLIO, GIOVANNI SENECA, DANIELE Dall’Omo, GIMMI VILLOTTI, DAVID DI GREGORIO, MICHAEL ROSE, TINO TRACANNA, SANDRO CERINO, RICCARDO LUPPI, GIULIO VISIBELLI, ACHILLE SUCCI, MICHELE BOZZA, CLAUDIO CHIARA, LUCA VELOTTI, MAURIZIO CARUGNO, MAURIZIO CALDURA, FABIO MORGERA, FLAVIO BOLTRO, ALBERTO MANDARINI, MARCO TAMBURINI, RUDI MIGLIARDI, ROBERTO ROSSI, FASO, FERRUCCIO SPINETTI, PAOLO COSTA, MASSIMO MORRICONI, SATURNINO, PIPPO MATINO, ROSARIO BONACCORSO, PAULINE FROM THE DOOR, GINO TOUCHE, ROBERTO BONATI, RICCARDO FIORAVANTI, MARIANO NOCITO, ENZO THE GREEK, MASSIMO PITZIANTI, GIANCARLO GAZZANI, PEPPE SERVILLO, PAOLA FOLLI , TIZIANA GHIGLIONI, JIANDRI, QUARTETTO VOCALE PAUSE OF SILENCE, CARLO GARGIONI, CESARE PICCO, DANILO REA, MAXIMUM COLOMBO, MARIO PIACENTINI, MARIO RUSCA, DADO MORONI, ANDREA POZZA, ANDREA DULBECCO, SAVERIO TASCA, QUARTETTO BARRUECO ARCHI, GNU Q UARTET, QUARTETTO ARCHI POSTACCHINI, and finally GRANDE POETA and COMPOSITOR, PAOLO CONTE, with whom he co-operates very long, very important and extremely decisive for his compositional musical formation.And it is with this orchestra, directed by the PAOLO CONTE Master, who plays in the most prestigious theaters of the world: Paris, Valencia, London, Amsterdam, Brussels, Barcelona, Grenoble, Orange, Saint-Tropez, Carcassonne, Dussendorf, Frankfurt, Hamburg, Denhaag, Rome, Milan Zurich, Geneva, Naples, Berlin, Hantibes, Montraux, Monreal, Cannes, Monaco, New York, Boston, Las Vegas and Los Angeles. PAOLO CONTE has also arranged and orchestrated “MOZAMBICO FANTASY” (in collaboration with Massimo Pitzianti) and “PASTA DIVA” for the “RASMATAZZ” project performed with the Pesaro Symphony Orchestra and the Philharmonic Orchestra of Turin. From 1995 to 1999, he directs and composes for the ORCHESTRA DI PERCUSSIONI he has designed, formed by the best Italian Drummers and Percussionists, building a Trend and Research course. In the same year he participated with his quintet, to a prestigious concert with GARY BURTON and MILT JACKSON for the “FANO JAZZ” Festival, attracting great public and critical success. In the same year he performed, in First Absolute, the concert of contemporary music for Guitar, Marimba and Orchestra by ENNIO MORRICONE, with G.SENECA (chit.) And the Pro’arte orchestra. In 1997 he was IN TOUR (L’ALBERO) with JOVANOTTI. In 1998 he collaborated with producer MICHELE CENTONZE, for PAVAROTTI INTERNATIONAL, in the capacity of Orchestra, for CELINE DION, SPICE GIRLS, STEVE WONDER. She has been working for years with Dr.SILVIA PAGGINI Head of the CHILDREN’S CHARITY association, holding concerts and seminars with the Poet Guatemalteca DANTE LIANO. In 1999 he teaches “Improvisation in Music Minimalism” at the G.ROSSINI Conservatory of Pesaro in collaboration with pianist MARIO TOTARO.The following year, he becomes extremely important for his artistic growth because he knows one of the greatest international percussionists, LUIS AGUDO (Argentina), with whom he has strong friendship and a very constructive and fertile artistic collaboration, That becomes a record project, unique musical stylistic characteristics in the international landscape of the Composition of the Eternity, (PERCUSA) silence takes shape, is disorganized and produced by RED RECORDS. For the INTEATRO association and the PERGOLESI theater he arranged and orchestrated the ballet (CORTO MALTESE) on PAOLO CONTE’s music and directed by GIORGIO GALIONE performed by the Marchigian philharmonic orchestra directed by PAOLO SILVESTRI. For the vocal group SUMMERTIME, (Gospel Choir) directed by WALTER FERRULLI, he orchestrated and directed the Christmas Concert, the PADOVA VERDI Theater with Padovana Symphonic Orchestra and international guests. In 2005 he collaborated as a composer and author for the new record project of ANDREA GIUFFREDI, ANACORETA, with international guest RANDY BRECKER, produced by SUMMIT RECORD’S AMERICANA. In 2006 he collaborated as an orchestrator with the AVION TRAVELs at the DANSON METROPOLI project produced by CATERINA CASELLI SUGAR, PAOLO CONTE’s music, winning the DISCO D’ORO. In 2007 he wrote the soundtrack and the music, the cartoon, for RAI, then distributed all over the world, PIPI PUPU ‘and ROSMARINA, with the Director of ENZO D’ALO’, scripts by VINCENZO CERAMI, drawings of ANNALAURA CANTONE and the voice of GIANCARLO GIANNINI. For CATERINA CASELLI and DAVID FOSTER, he collaborated as MAESTRO PREPARATOR and RESPONSIBLE ORCHESTRA, to the project “BOCELLI LIVE IN TUSCANY”. In 2008 he collaborated as arranger and conductor of the orchestra, to the LA CRUS album project “I DO NOT BELIEVE THAT SATURDAY”. In 2010 she collaborated with ANNA OXA and LORIS CERONI (arranger and producer) as an orchestrator for her latest record project. 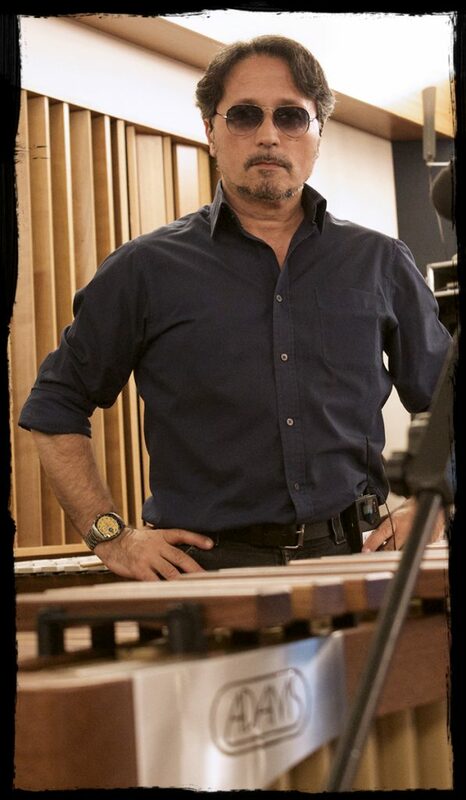 In the same year he collaborated with the new record project of ANTONELLA RUGGIERO as a marimba and vibraphone. In 2010, he made all the elaborations and arrangements for RAI for the new broadcast of FABIO FAZIO AND ROBERTO SAVIANO (VIENNA VIA CON ME) with the original music of PAOLO CONTE. He collaborated with MUSICANUDA, FERRUCCIO SPINETTI and PETRA MAGONI, as Arranger, Orchestra Director and Artistic Director, for the album project BANDALARGA, realized with the Chamber Orchestra of the Marches. For EMILIO MACCOLINI, he wrote: “RITMIC PATHS” for five performers and reciting voice. “THE SMALL TREE” for decimation of percussion. “SONO PERCORES” for decimation of brass and decimation of percussion. “ART FORMS” for trumpet orchestra and reciting voice. “BOLIVIA” short sonata for two pianos. “SENECIO” paintings in concert form for piano, vibraphone, marimba and percussion. “DUET” for Marimba and Piano “SEQUENCE 1” for Marimba and Piano “KASTURA” for Marimba and Piano “THE WOOD” for percussion quartet. “NIGHT” for piano. “ELIOPSIS” for Marimba and Piano. “THE HORSE BALL” For Piano. “ANTITES” For two Clarinets in Sib. “MARGOLA’S SONG” For Vibrafono.”ILLUSSION” for Symphonic Orchestra “OSSESSIONE” For Clarinet at Sib and Bassoon. On the didactic level she has held seminars of Contemporary Composition, Percussion Keyboards, Music for advanced courses for: GASLINI FOUNDATION Lecco, MANTOVA CONSERVATORY, CONSERVATORIO DI CAGLIARI, CONSERVATORIO G. ROSSINI of Pesaro, DAIGO MUSIC SCHOOL Padua, MODERN MUSIC ACCADEMIA Milano, Verona, Modena, LICEO G.MARCONI Pesaro, C.MONTEVERDI MUSICIAN INSTITUTE, IEA INTEATRO ASSOCIATION, MUSICAL INSTITUTE FOUNDATION Aosta, Ferrara’s conservatory. Iseo Jazz.”97″(Songbook) Planets Promenade Suite. Parole d’Amore scritte a macchina. The best of Paolo Conte 1. The best of Paolo Conte 2. Paolo conte Arena di Verona. Io non credevo che questa sera. Bala Boulon. PERCUSA. Live in Fenice.